Hurrah for the House of Lords who threw out 42 days last night. Resoundingly, and thumpingly, in one of the biggest votes against the government ever. Normally this would be big news, especially after all the political capital invested in it by Gordon Brown but Bankmageddon drew the fire. UPDATE: Great piece from Shami who has done more than perhaps anyone else to nail this. 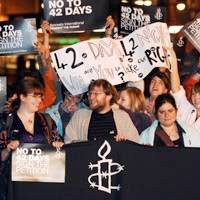 I was up in Leeds with Kate Allen and the campaign team from Amnesty when I heard, at the launch of their new film. On the train back, Davide from Blairwatch filled me in on Jacqui Smith's live reaction, holding the phone close to the TV so I could hear her. It sounded like a lot of petulant squawking to me. We toasted the 42 days demise with relief. On closer examination, the Home Secretary's speech was even more awful than it sounded. It is ludicrous to say that people like Eliza Manningham Buller, recently-retired head of M15, the director of public prosecutions Ken McDonald and the former Labour attourney general Lord Goldsmith are people who are 'prepared to ignore the terrorist threat'. In fact it was their extremely detailed knowledge of the terrorist threat that led them to point out that the bill was dangerous and counter-productive. And to prove that this is all about using fear to play politics, now there's a one-pager to be whipped out if there's another terrorist attack, described by the shadow home secretary as 'one of the most bizarre things I have ever read'. 42 days won't go through when people are calm and rational and have time to think about it, so we'll stuff it away for now only to shove it through when everyone's in a highly emotional state instead. Classy. However, 42 days is not the only dodgy and disturbing part of the counter terrorism bill. See Marcel Berlins on secret inquests. When I enquired about this, I was told by an insider that the motivation for this part of the bill is so that wiretap evidence or evidence which could not be used in public court because it would endanger, or identify, say, a security services officer working undercover could be shown to the family of the deceased, privately. I can see the point of this, but unfortunately good intentions are no excuse for bad law. The Lords will debate the rest of the bill on 15th and 21st October. I was against 28 days, by the way. Hopefully we can get some traction to repeal that next. Great work - and thanks also for the link!